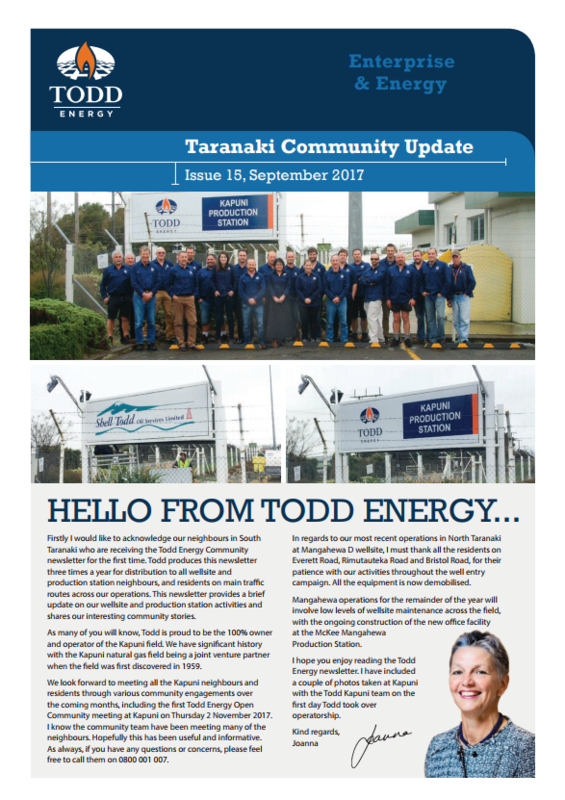 Firstly I would like to acknowledge our neighbours in South Taranaki who are receiving the Todd Energy Community newsletter for the first time. Todd produces this newsletter three times a year for distribution to all wellsite and production station neighbours, and residents on main traffic routes across our operations. This newsletter provides a brief update on our wellsite and production station activities and shares our interesting community stories. As many of you will know, Todd is proud to be the 100% owner and operator of the Kapuni field. We have significant history with the Kapuni natural gas field being a joint venture partner when the field was first discovered in 1959.
neighbours. Hopefully this has been useful and informative. As always, if you have any questions or concerns, please feel free to call them on 0800 001 007. In regards to our most recent operations in North Taranaki at Mangahewa D wellsite, I must thank all the residents on Everett Road, Rimutauteka Road and Bristol Road, for their patience with our activities throughout the well entry campaign. All the equipment is now demobilised. Mangahewa operations for the remainder of the year will involve low levels of wellsite maintenance across the field, with the ongoing construction of the new office facility at the McKee Mangahewa Production Station. I hope you enjoy reading the Todd Energy newsletter. I have included a couple of photos taken at Kapuni with the Todd Kapuni team on the first day Todd took over operatorship.